I want to talk about composting toilets and greywater systems from the standpoint of the chemicals (and smells) involved, the feasibility for a disabled person, the costs, and the benefits for someone with MCS to being semi (or totally) off the grid. I have the SunMar Spacesaver in my tiny house because it's the smallest indoor self-contained composting toilet I could find in Canada, and the only one that will fit in my tiny bathroom. It was also the best-priced unit. I absolutely do not recommend this toilet as it completely fails at handling liquids. Here are a few of the other challenges followed by some recommended brands. This post contains affiliate links on some of the products I recommend. Toxic Additives in Composting Toilets? I had a bad chemical reaction to the additives. I didn't know that the toilet requires a significant amount of input in terms of additives (and money). There are three things you need to add regularly: 1) an enzyme spray which smelled fine to me, like a very light non-toxic soap might smell, 2) a bulking material of hemp, peat moss.... and maybe sawdust? This material will certainly be problematic for those extremely sensitive to mould. I can't detect any, but I don't see how it could be consistently mould-free. (You could definitely make/source your own bulking material. All the indoor self-contained composting toilets that I know of require some.) And 3) the microbes that you add to speed up the compost and keep it "odourless". I had such an acute reaction to the microbe mix. It smells somewhat like a urinal cake. Everything online said it was non-toxic and natural... hmm. I called them to ask what is in it and they said citronella. Citronella contains methyl eugenol which repels bugs and is a possible health concern needing more studies to confirm its safety. There are a few essential oils I consider to be harmful for MCSers and citronella is definitely one of them. I had to figure out what kinds of microbes were needed for the toilet and I found out that EMBokashi will work just as well and doesn't have fragrance added. After using the toilet for a few months, I can say that the enzyme spray is not necessary. You could just use the Bokashi or Bokashi and a bulking material. However, I am not happy with this model at all. The upkeep is very smelly work and it often overflows with only one person using it. Dealing with the overflow is horrible. Even before it overflows the system is such that liquid accumulates below the tray where it becomes very smelly, and mouldy. One person using this toilet full time requires that it overflows into a septic system or blackwater system. Not very self-contained at all. Another chemical issue is with the unit itself. It needed some offgassing outside to get rid of the plastic and glue smells. I left it outside for a week. A month would have been ideal. There is some installation necessary that ideally would be contemplated before building the bathroom of a new house! A vent has to go through the wall, outside, and above the roof line. An emergency overflow valve needs to go through the floor and out to.... somewhere (a bucket)... or to the septic or sewage drain if you are on the grid. You do not need to have water as an input for this type of unit or bolt it down in any way. There are electric and non-electric self-contained units. The Spacesaver is electric. There is a need for a special outdoor compost for self-contained indoor composting toilets; they say the humus the toilets produce is totally benign but there is no way it is in there long enough to be benign. There is a huge benefit to being off the septic system and that is the freedom to put your tiny house/yurt/dome on any piece of land with some extra amps to spare & a fresh water hose (and of course you could get totally off the grid with solar panels and rainwater collection). If you are comparing the initial cost and cost of (ongoing) inputs to just hooking up to a city sewage line, then the self-contained composting toilets are going to seem expensive. If you are comparing the cost to installing a rural septic tank and the maintenance of that septic tank, then it starts to seem like a really good deal. If you are extremely sensitive you're going to want to make sure you can source some tolerable bulking material before you start. A lot of the maintenance also includes some strong smells of excrement so you have to be able to tolerate that. I have seen some mould growing in the finishing drawer. Another challenge for people who are disabled is that there is some work - there is the buying of the additives and maintenance. Maintenance involves turning a crank every second day for a minute. Unclogging the mesh screen if that ever clogs up, checking to see if the system has overloaded via the emergency drain and other troubleshooting if anything goes wrong. There is a fair amount of troubleshooting so far for me. The fan will have to be replaced or fixed if and when it stops working. You also empty out the bottom drawer of benign humus every few weeks. I'm having trouble with the Spacesaver as I don't think it has enough capacity for one person let alone two. The tray is filling up too fast, which can be a major problem if you don't have somewhere safe to dump it and it overflows liquids. If you are building a new house (that's not on a trailer bed) on a site without sewage or septic already in place, you are probably going to be subjected to building codes that require more conventional systems. Those who live in tiny houses recommend two types - either Nature's Head Dry Composting Toilet or the Separett. What's different about these is they separate the urine out. This is crucial. It is the reason the Sunmar is overflowing and going mouldy in the tray. I would go with one of these for sure when I replace the Sunmar. The other type that is popular now and is even more suitable for the chemically sensitive is the dry flush self-contained. A dry flush self contained uses bags. I have never seen this in action. The bags are somewhat expensive and you have to carry them out to a trash bin. Some people are really happy with this and it eliminates a lot of problems with smells and mould with the other ones. This post deals with indoor self-contained units but other types of composting toilets include: an outdoor bucket system, an outdoor dug out (outhouse), indoor central flush, central dry, and indoor bucket systems. Incinerating toilets like the Cinderella are making a bit of a comeback though I don't have many clients that have chosen this option because of the smell of the burning. 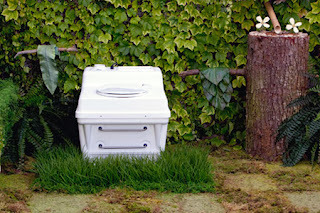 If you live in a simple trailer or van or are camping you may want an even simpler toilet that uses bags. The Cleanwaste one is popular. And I have tried this one with success. Being off the septic system means you also need to safely recycle your greywater - which is the water that comes out of the kitchen sink, bathroom sink and shower. These contain more bacteria than you think via raw meat and the bacteria on your body etc. Eco-Sense has a really good free overview and guide including using a worm bin system to remove food scraps from the water. Here are the instructions for the worm bin filter system. There are a lot of different types of systems and for more detailed instruction this book is super user-friendly and outlines the simplest options depending on the number of people you have on the system. You need both some kind of filter and water dispersion. We tried just burying the pipe so that the water would simply drain into the ground but the water could not absorb fast enough and it backed up through the house. Gross, yes. We dug a small pit and it still backed up. Right now I have a larger pit but it still has no filter on it, it worked fine for years with little upkeep. (Note it's not technically safe to have the water drain above ground, but this did work fine). Disclosure: Some of the links to products on this page go through my affiliate partners and some do not. Whether a product has an affiliate program or not does not influence my choice of recommendations. As an Amazon Associate I earn from qualifying purchases through the Amazon links. I thought I wrote a comment on this post when you first posted it, but I see I must not have published it. Fascinating...I guess I should have known they use chemicals in composting toilets, but I've never considered it. Good to know. What are Canadian restrictions on "trailers"? Are they fairly open-minded or do they have all kinds of rules on where you can park and how long you can live in it (like in USA)? You don't have to use the chemical additives though. Restrictions on tiny homes depends on the area but it's fairly easy to find somewhere to park them in BC. sunmar and envirolet composting toilets are a joke. a big money sham that will leave you feeling frustrated and robbed.